One of the common factors invariably included in advice from security experts is to always keep software up-to-date, and there is a very good reason for that. Despite the best efforts of software developers, some programs can (and do) include vulnerabilities which can potentially be exploited by cyber-criminals. That’s why it’s important to always apply security patches as soon as possible, in other words… keep your software up-to-date. This is particularly true of the more popular and widely-used programs, which represent a potentially lucrative target base for attackers. 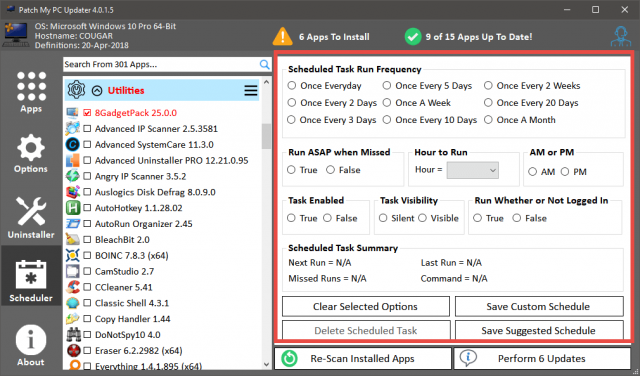 A lot of programs already include their own automatic or manual updater but you might be surprised at just how many don’t, and even in cases when an updater is built-in, they can often be unreliable. 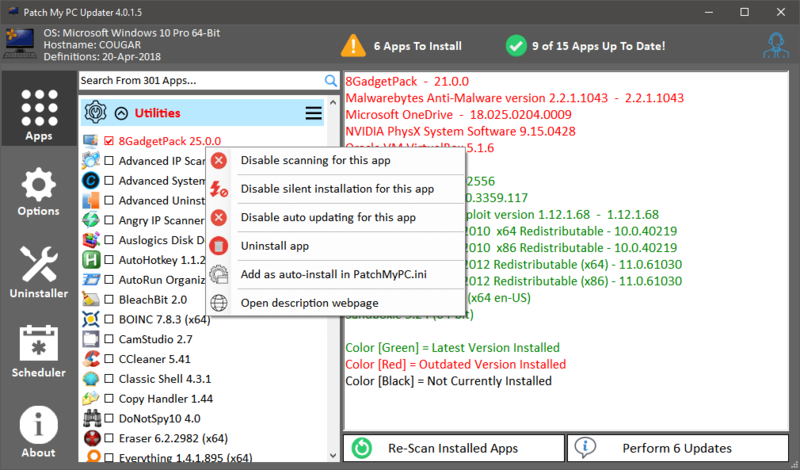 There are several programs available that will check your software for updates, and some which will even proceed to download and automatically install those updates for you, but I have never come across one of these types of programs as effective and configurable as Patch My PC – but wait, there’s more – Patch My PC is also free, PORTABLE, and very small in size. It will take a little while, just 5 seconds or so, for Patch My PC’s main interface to show up. That’s because it’s initially working in the background scanning and assessing your software. So, when it does appear, Patch My PC has already done the first part of its job. In the left pane you’ll see a list of all programs supported by Patch My PC (over 300) and the right pane displays the scan results. 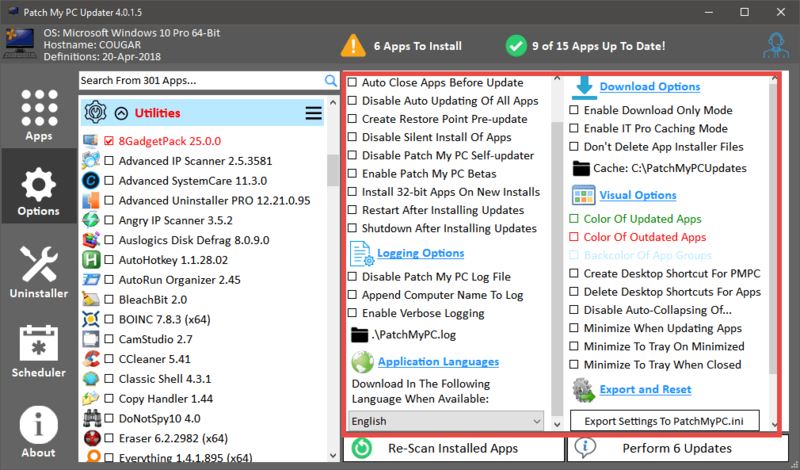 Note the color coding: Red = outdated software, Green = up-to-date software, Black = the software is not currently installed on your system (left pane only). Or, if you just want to selectively prevent programs that have been flagged Red in the right-hand panel from updating, simply remove the tick from the corresponding entry in the left hand panel. Another useful feature is that you can download the latest version of any program included in the list (in the left hand pane), even if you don’t have it installed — check the box next to the program and it will be downloaded and installed along with any other updates you choose. PROS: Free, Portable, Highly Configurable, Lightweight, Safe and Reliable. CONS: Restricted to supported applications only– although, the list is comprehensive and includes most, if not all, popular applications. Also, the developer is very open to suggestions, via an active forum, for adding new software titles. I’m impressed with Patch My PC, by far the best of these types of applications I’ve come across, plus the fact that it’s portable adds heaps of appeal. 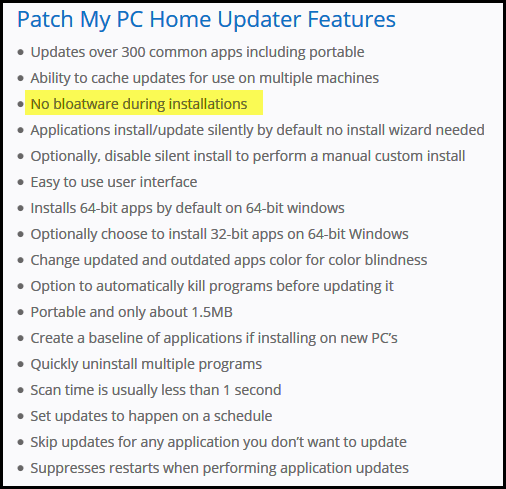 I’ve always tended to manually update my software and openly admit I was quite surprised when Patch My PC flagged six installed programs for updates. In the future, I’ll be running Patch My PC periodically to keep an eye on this situation. Highly recommended. Thank you for finding and sharing this program Jim. It covers almost every program I currently use which requires several updates yearly. I was pleasantly surprised that it found two replacements prior to official notice. Microsoft.NET Framework 4.7.2.exe and Mozilla Firefox 60.0 (x64).exe. Should mention that files typically supplied by Microsoft might require a reboot to install fully. Also some programs like the Gomplayer open your browser and connect to the Homepage. Ticking the “Restart After Installing Updates” aids you in using the Scheduler while clearing browser connects. I toured the support forum where I discovered many interesting facts and contacted Technical support via email. It was to inquire about the error 3010 and the reply was quick (less than their one day posting), stating a reboot was required. 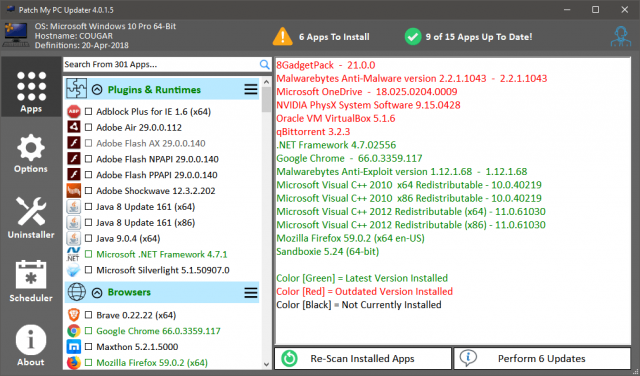 All things considered, this is a very good put together software package which is supplied to users for Free. Might consider making a donation if it continues to improve, Mindblower! You are most welcome MB. I had tried this program some time ago and found it lacking then. With your article, I decided to try it again. It found 10 programs needed updating, so I let it do its thing. Everything seemed to work fine except when I tried to use IrfanView, it was all locked up. All my previous settings were gone. No mater what I did, I could not make changes to the “.ini” file. I, the administrator, did not have permission. Changing the permissions under Windows Explorer would not take, it just reverted back to “read-only”. Also, I found that the plugins had gone missing. In the end, I completely uninstalled IrfanView with Revo Uninstaller, downloaded the latest version along with the plugins, and reinstalled. Everything works good now. I haven’t decided to abandon Patch My PC for now, but I will not allow it to update IrfanView in the future. The other programs it updated appear to be fine. Please use always the current IrfanView and PlugIn version. Not only did the update not include the plugins, it did something with the program folder that I could not undo. I was not able to change the status from “Read-only”. All attempts were reversed after I clicked “OK’. I ran into a strange problem last night. One computer automatically upgraded my Malwarebytes to version 3.51 earlier this week. The other was upgraded by PatchMyPC, but after the reboot, there was no tract of Malwarebytes on my computer. 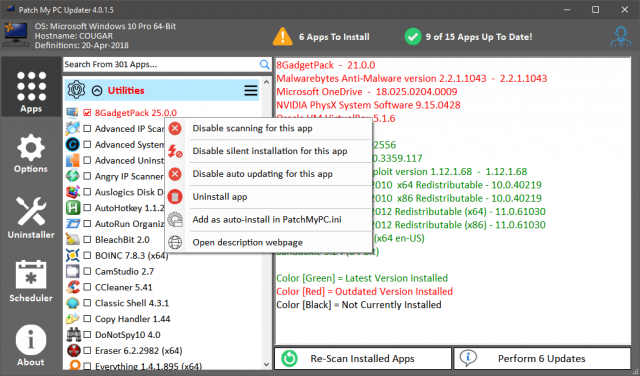 So I clicked the Malwarebytes box, unclicked the reboot box, did a re-scan and ran the 1 app to install. This time Malwarebytes appeared, as if it never disappeared. Can only say it was a scary experience. Their forum contains comments from users who reported problems and since it’s up to version 4.0.1.5, the program is being updated to correct bugs. For me, I enjoy and will continue to use it. Almost all the programs I use have some glitches every now and then (not to mention Windows), so we either accept or reject, Mindblower! Thanks for the excellent overview! I’ve been using Patch My PC for some years now. With the demise of the Secunia PSI, it’s a handy way of determining, to borrow a line of John Wayne’s from one or another of his films, who flung dung. A few years ago, I ran into some issues with its updating abilities, so I merely use it as a scanner, which meets my needs (I prefer to perform installations manually, anyway) — and it is especially useful on clients’ machines. 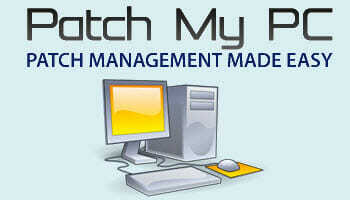 For certain applications, PMPC will occasionally report that an update is still available post-update (Firefox is one). 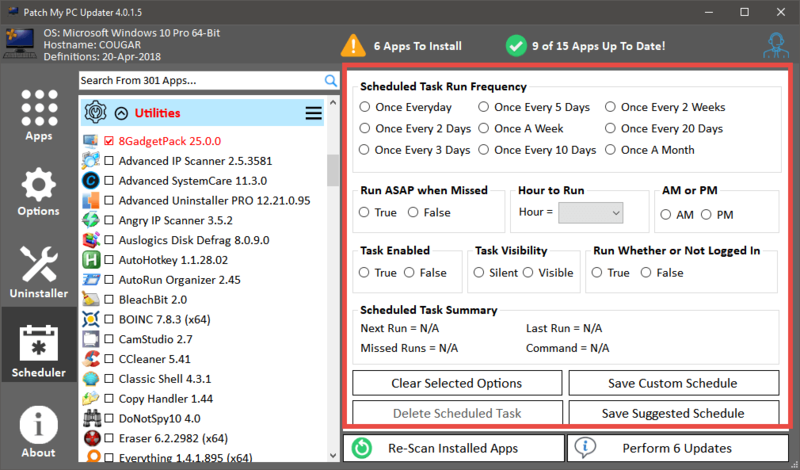 This appears to be caused by remnant files left in place from the earlier version, but being aware of that makes it a relatively minor issue (CCleaner continues to accurately report the active version installed, so it is used as a double-check). P.S. BTW, ABC Classic FM have had some truly outstanding programs over the past few months. I like the way you are using Patch My PC, definitely the way to go. Thanks for your comments, appreciated. Thanks for an excellent review of an excellent program. I just ran it. It located and updated two programs that Ninite, my other excellent updating program, had missed. I plan to run both programs side-by-side for a few months to compare them. Great find – thanks for passing this along. I assume whatever downloads were used to install gets deleted – I didn’t notice any confirmation message regarding deletions. Also, I suppose I still need to go through each item since some of my software were giveaways and if I upgrade I’ll lose it or get demoted from pro to home version. Nonetheless, that’s a small price to pay. I think that would be a fair assumption mate. I’m not 100% certain but, logically, I suspect the executable would be downloaded to a temp folder. I suppose I still need to go through each item since some of my software were giveaways and if I upgrade I’ll lose it or get demoted from pro to home version. Absolutely! It’s always best practice to check through a list before applying any actions anyway. Seems to be very good software. Ran it on a couple of my machines, a few glitches but nothing serious. If one runs XP, like I do then one will have to download the Patch My PC that supports .Net Framework 3.5.